Happy Tuesday loves! Our crazy Florida weather is back in full swing. Today's high is 73 and two days ago it was in the 30's. I swear you never really know what to expect any more. It might look really nice out then you step outside and and realize it feels nothing like what it looks. I've just decided my best course of action to beat the weather is to dress in layers. This super comfy long sleeve swing dress is perfect for layering with a cozy blanket scarf. One of my favorite things in an outfit is something that can be taken from casual to dressy. This dress is perfect with sandals, boots or even heels. I decided to rock the Hunter boots with this outfit mainly because it was off an on showers (yay Florida!) all day and I hate getting my feet wet! I shared this scarf last week and I wasn't kidding when I said it's been a staple for almost every outfit I wore last week, it's the coziest, warmest scarf perfect with any outfit! I love the color of your dress, and it is perfect with that scarf! Cobalt is totally your color. It looks wonderful on you! Glad to hear the weather is back to normal. Hopefully it stays that way into next week so I can enjoy some beach time on my vacation! I love this color combo- it looks great on you! And this crazy weather is making getting dressed so hard- tights yesterday and bare legs today! Ha! That is my favorite color for blue! Especially with dark hair. I have a shirt in that color that I wear all the time, but it looks awesome as a dress!!! This color is beautiful on you! Piko tops/dresses are SO soft! Such a cute dress, it's such a fabulous color on you! Love the combination of cobalt and the black and white plaid too! Layers with those temperatures is totally the way to go! Love the color of the dress, so pretty and the scarf is the perfect accent. So pretty! Love that scarf! LOVE that oversized scarf- and cobalt blue is one of my faves! Gorgeous, girlfriend! The color is gorgeous and I love how versitile it is! Not every dress would look this good with a pair of hunters! You look adorbs! Such a roller coaster with the weather - I'm wearing the same boots tonight to trudge through these mountains of snow, haha. That's a great blue on you! This is such a great outfit! I love the dress & the scarf & the boots! I love that that is a dress on you! It would totally be a tunic on me. I also am totally down with the black boots and scarf! Perfection! That color looks amazing on you. I cannot get over how cold it is there. 30's is totally cold weather. LOVE the color of the dress!!! I can't believe it was 30 and then 70?!? That's crazy! So adorable! 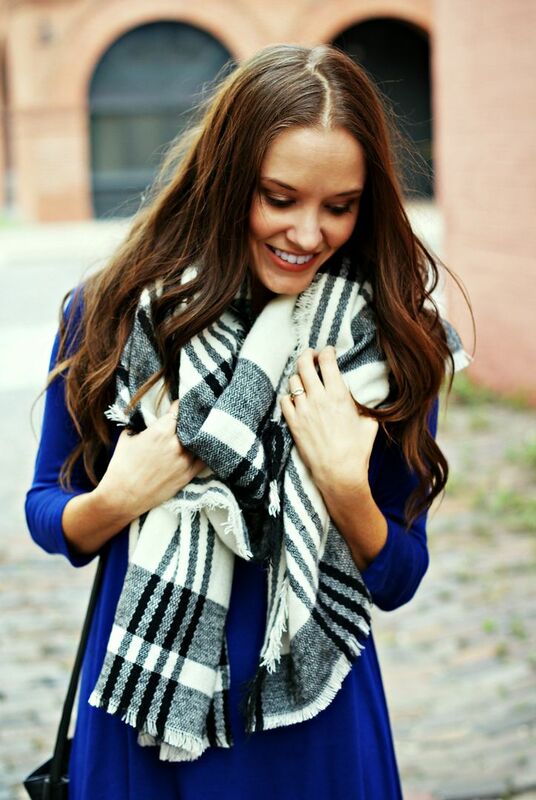 Loving this bold blue paired with the black-and-white scarf! The swing dress looks perfect with the hunters! I love the color of that dress it would be perfect for Gator games! I love the bold colors of that cobalt blue, pairs very well with that scarf!! I love your dress!! It looks similar to the swing dress that Old Navy has too. It's warmer down here too, it's nice when I want to wear dresses with a scarf. You're so right, that dress is so cute and can totally be dressed up or dressed down depending on the right shoes and accessories. I have yet to buy a blanket scarf! I think they're so cute, and I would love to get one, I just haven't actually pushed the button on one yet. woah, i could not handle the weather varying that much haha. okay, that settles it, i need that scarf in my life. i absolutely love cobalt, such a fun colour! Love the scarf and Hunter boots! Yes, this weather is crazy. The temps jumping around so much are annoying and often get the little ones sick. Layering is definitely key in this bipolar weather. The scarf looks so nice and warm and I love the pop of color from the cobalt dress. Cobalt blue looks awesome on you! Love it paired with that big scarf. Jealous of your 73 degrees today, enjoy!! I absolutely love this color on you! You know I love the "UK" blue! ;) This color really makes your skin pop! I love this dress! Hope the weather settles soon! Those colors together really work well and you look great in them! It was mid 40's here today and was like a heat wave- I love it! I love how the black and white pops against the blue - such a pretty combo! gorgeous. love this dress and scarf. cobalt is def your color. LOVE it. Gorgeous! I absolutely love that blue dress - and it is perfect on you!